In December 2014, local residents discovered that Kinder Morgan’s Plantation Pipeline in Belton, SC (Anderson County) had ruptured, spilling at least 369,000 gallons of gasoline. An old patch on the pipeline broke, and Kinder Morgan was not aware of the breech until local residents smelled gasoline and found pools of gasoline on the ground. Almost four years later, the petroleum plume is expanding, the neighboring creek is still being contaminated, and Kinder Morgan still has not recovered a significant portion of the petroleum that is evident in their monitoring wells. On December 28, 2016, SELC filed a lawsuit on behalf of Upstate Forever and Savannah Riverkeeper. (The groups had filed the required 60-day notice of a pending action on October 24.) The suit sets out violations of the federal Clean Water Act and was filed in United States District Court in Anderson. The suit asks that the District Court require Kinder Morgan to stop discharging petroleum pollution into the waterway, that Kinder Morgan be required to remove gasoline from the site, that Kinder Morgan put in place more effective treatment of groundwater before it reaches the stream, and that Kinder Morgan be required to pay substantial fines for its continuing illegal pollution. 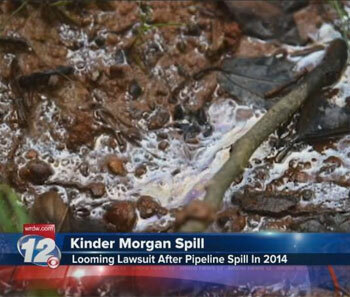 Under the Clean Water Act, Kinder Morgan can be fined up to $51,570 per violation per day. After the suit was filed, Kinder Morgan re-started its product removal, submitted a Corrective Action Plan to DHEC, and began the process to begin other remediation efforts at the site, including biosparging and installing a “bubbler” in the creek to speed up the break down of the petroleum. This appears to have been ineffective in reducing the contamination and preventing plume migration. Kinder Morgan filed a Motion to Dismiss this suit and SELC’s response on behalf of Upstate Forever and Savannah Riverkeeper can be read here. In April, a District Court Judge dismissed the case for erroneous reasons. Recent test results indicate that pollutant levels in Brown’s Creek still far exceed safe levels. Upstate Forever and Riverkeeper checked up on the site on May 11, 2017 and saw several areas of concern, including tree die-off over the seep, a petroleum sheen in the creek below a containment boom, and stressed groundcover in an area where contaminated groundwater may interface with the creek downstream (away from the seep). SELC appealed the dismissal on our behalf to the 4th Circuit U.S. Court of Appeals in mid May, and oral arguments were heard on Thursday, Dec. 7, 2017. On April 12, 2018, the 4th Circuit released its 2-1 decision in our favor on the appeal. This case will likely set precedent and has drawn national attention. You can read the decision and the briefs filed in the appeal below (PDF format). January 31 – DHEC hosts the public meeting requested by Anderson County; over 100 citizens attend. Kinder Morgan does not. April 20 – Judge Herlong dismisses the suit.